Beautiful rings. These are amazing ‘modern classics’. Which jeweller created your rings? HotPozzum, you're another one of those cheaters who show us more than 5 CS rings! J/K your moonstone and opal rings are amazing. Thanks for sharing. chatoyancy and suzanne2 like this. I actually really like that little three stone with the dark green center. Tsavorite? MissyBeaucoup and Hivona like this. Just to be clear I would put the head onto a White Gold shank that would blend with the color of the current setting. I really like the oxidized look of the silver and the stones. Oh yes indeed you do compare!! Could I beg for hand shots for some of these please? Gorgeous dreamy colors, all, and I love that you have them in yellow gold. So rich. MissyBeaucoup, leslie1956 and suzanne2 like this. Whaddya mean "you don't compare"?? Come on girlfriend, those are gorgeous! voce and Acinom like this. I know it's cheating to put 6, but I couldn't help it! It's almost impossible to get all 6 to look good in 1 pic, but I tried my best. TheGarnetGirl, Hivona, Bluegemz and 5 others like this. @lovedogs Tell us more? I only recognize your gem silica stone. The gem silica is set by Ivy and Rose, the electric blue topaz (cut by Doug Menaude) was set by Sally at Heart of Water. The orange is a Spess garnet purchased from Jason Brim, recut by Dan Stair and set by an Etsy vendor in rose gold. The 5 stone is aussie sapphires sourced and set by Michael Edgett of Gemshoppe. I wish the center stone was brighter, but I couldn't afford it and Michael did an outstanding job. The light blue topaz was cut by Doug Menaude and set by another etsy vendor in silver. The cut is INCREDIBLE, and the ring is a great fit. The last one is a sunstone iolite from The Gem Trader, set by Alistair Kelsey. One of my favorites, and the schiller is incredible in the right light/angle. Actually *whispers* it’s just created Emerald & CZ, it was the first ring my husband gave me when we were dating and like 20 years old... I don’t wear it anymore but keep it coz it’s sentimental! Sorry about posting more than 3 rings but this was the only nice pic I had on my phone... I’ll try to get some decent hand shots soon. MissyBeaucoup, suzanne2 and elle_71125 like this. Thanks so much, that means a lot coming from you! Your ring collection is my dream. My collection is a bit of a mix but the moonstone and zircon were both made by a local jeweller in my home town. Reds get de-saturated when I upload a pic but these are probably my prettiest CS rings. SparkliesLuver, Stone Hunter, AceofHearts and 10 others like this. Gorgeous pink/red selection with a hint of apple green!! What are the specs? Ring finger- 1.41 Burma red Spinel with 1 carat diamond sides. 1.47 Mahenge Spinel with either .75 or 1 carat diamond melee. 2nd finger- 3+carat Chrysoberyl with diamond sidestones. 3.99 carat Raspberry Spinel with .20 carat diamond accents. Index finger- Old stock Mahenge Spinel (PS members helped me pick this one- I think it is around 1.5 carats) with diamond melee. 1.89 carat Burma red spinel with diamond accents. MissyBeaucoup, MrsKMB, Acinom and 1 other person like this. @LisaRN spinels galore! They are gorgeous, and I like that the settings are so varied. MissyBeaucoup and LisaRN like this. Such gorgeousness in this thread! I only have an amethyst RHR that I bought while on a cruise in the Virgin Islands. I actually love the amethyst, but I am not a huge fan of the setting anymore. I would like to add green and deep red gems to my collection in the next couple of years! This thread gives me lots of inspiration! @Seaglow : OMG that purple diamond! I drool over the ones posted on DBL and always wondered if I ever managed to afford one, how would I set it? Now I have an idea! Rare gem lover and lovedogs like this. Any new ‘favourite 5’ to share? My gemstone hobby/obsession only started in April 2018, so I only have 10-12 rings total, some of which are fashion rings from years and years back; my prettiest are the top 5 pictured. I'll describe them in the order they appear in the picture, top to bottom, but I have not decided on a hierarchy of favoritism. My favorite ring is in the middle, and it's special because it's the engagement ring that started off my gemstone collecting. Because the first picture didn't do the blue sapphires justice, I am including additional hand shots of them. Edit: I will have more rings coming from Yvonne, in a month or so, and I expect they will replace some of the rings in my top 5. MissyBeaucoup, prs, Burmesedaze and 11 others like this. Really cool collection. Are some of them satin finish? I love that sphene & demantoid ring sooooooo much! How often do you wear it & how is the sphene holding up for wear & tear? I've only had the sphene & demantoid ring for 5 weeks, and I wear it about once a week, so I haven't noticed any wear or tear on it. Sometimes viewed from the side there are streaks of a different color, and even if I get paranoid that I scratched the sphene, on closer inspection it's just dispersion/fire with no cracks or scratches. That said, I do try to be careful when reaching into my purse when I have this ring on. Hivona and leslie1956 like this. MissyBeaucoup, Rare gem lover, LisaRN and 8 others like this. Your rings are beautiful! You may only have five but they are five very stunning rings. How do you like your gray spinel? I have been contemplating buying one but I haven't pulled the trigger. The malaya garnet is gorgeous! 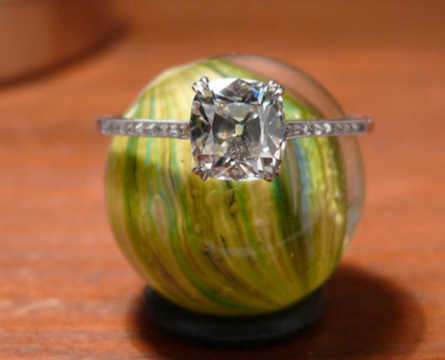 How big is the center stone? And the setting for the topaz, wow! Is that a concave cut? MissyBeaucoup and Eady like this. They are all beautiful but the grey spinel and pink sapphire ring grabs my attention by being unexpected and interesting. I really like it! Is that your Iolite on Alistair's website?! your ring is so unique! do you think it will ever find it's way on LT? suzanne2, AceofHearts, MissyBeaucoup and 5 others like this. Oh that aqua is blowing my mind. I have something similar in the works with a Tourmaline. I’d love some hand shots whenever you get the time!